Post application of shrink wrap? Discussion in 'Electronics & Electrics' started by dainese, Mar 18, 2019. Probably a very basic question given the level of discussion here. I love my earphones and my music. Always disappointing to have joints fail, or connections fail. I am wondering if I can fit shrink wrapping to sections of earphones or headphones to bolster those sections from failure. For example where cabling may join with a connector they are usually fitted with a flexi joint or a flexible wrap material. I may not want a skin tight fitting to allow for some play but wondering what i can do to prolong the life of earphones etc. Can you show some photos of failure? Hard to know what you mean, but unless the heat shrink is really thick, it's unlikely to protect it. common topic in all things electronic/electrical, many different methods of application (that vary by the design and how much protection is needed or legally required). As far as adding heatshrink, biggest hassle using that I've encountered on items with really skinny wires is making sure the 'shrink you use is large enough when uncooked to go over the 3.5 mm plug but good enuff to shrink down to grab the wire. I've had more than one event where I've wrapped some self-vulcanising tape on the skinny wire first, then 'shrinked ('zat a word?) over that. And occasionally I've just used serious quality self-vulcanising tape. Serious as in it bonds to itself quickly - seen the cheaper stuff need to be wrapped with wire or a cable tie until it decides to blend together. biggest problem with retro-fitting shrink tube over an existing cable, is getting a tube that's big enough to clear the connectors, that will shrink to the required size to actually offer strain relief. you can get 2:1 and 3:1 shrink ratios commonly enough. Putting heat shrink on can just move the point of weakness to where the heat shrink ends. 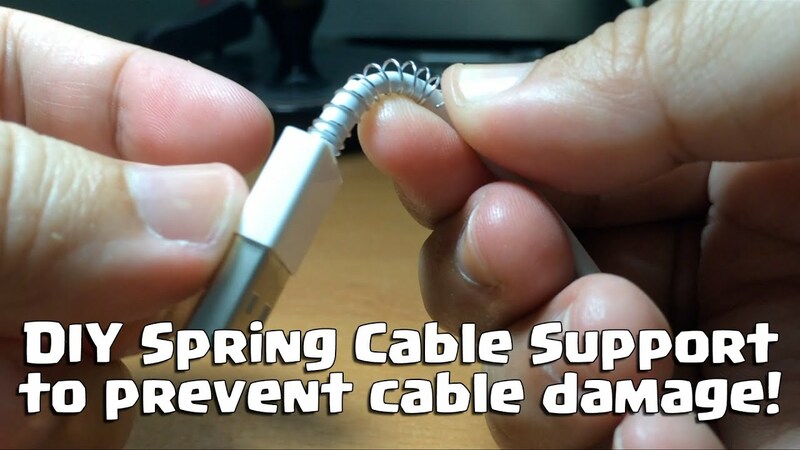 I don't see how that spring would help in most cases where the damage comes from people yanking the cable out by the cable and not holding the connector. At most the spring would help is if you're putting the cable in tight places and constantly being bent at the connector. Depends on the type of cable I guess, in modern times I haven't had nearly the number of breakages from competently made stock/pro stuff compared to gear that you would have used back in the days of tape. But there are always the manufacturers who are newbies or focus on looks (or audiophilic properties) over function that run into problems. well of course, the idea being you move the stress from a weak point - solder/crimp joins, terminals etc. to bits that are meant to be safely flexible - the wire/cable itself. The only time you need to concern yourself with fatigue cracking of wire/cable is if you use solid core conductors. you can get liquid electrical tape which would beef it up a bit. i always pull plugs from the plug, never the cable - never had an issue in the last 30 odd years. everyone else can keep the aftermarket cable business running. poorly designed (not enough strain relief designed in) or poorly made (assembly issues, cost cutting in production etc.) cables can fail without abuse. v81 and firey4059 like this. This reminds me of those times when you do your solder then realise you forgot the heatshrink. Doh!!! Somebody needs to invent a non-Euclidean heatshrink tube, that you can still put on the wire despite it being a closed tube. M.C.Escher style. Quick tickle on Uncle Google, looks like you'd have to hit evilBay for some over here in Oz though.